Christmas Tree Oreo Truffles are easy and fun holiday dessert recipe! Your favorite, 3 ingredients, Cream Cheese Oreo Truffles get festive makeover!!! These Christmas Tree Oreo Truffles are adorable homemade Christmas gift that will be appreciated by all who are lucky enough to be on your list! 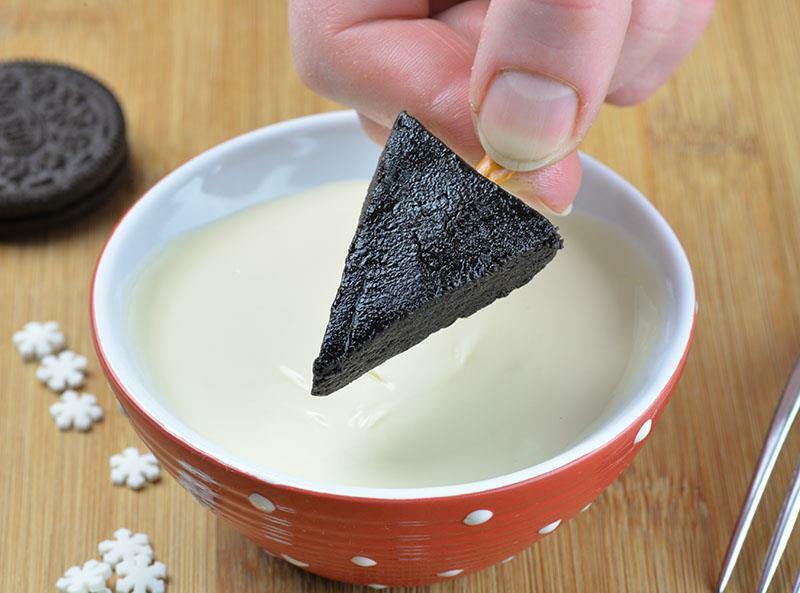 Combine it with a Reese’s Cheesecake and people will love you forever! In short, these cute Christmas trees starts from classic and simple Oreo truffle mixture.However, it’s yummy combo of finely crushed Oreo cookies and softened cream cheese. These two ingredients blend together are tasty enough and you don’t need any addition. But, when cover that with melted dark or white chocolate and you won’t be able to stop eating these. Definitely I’m sure you are at least once in your life made or eat Oreo Truffles. Therefore there’s no need to tell you how delicious and addictive these little bites are. In fact the only different between classic Oreo Truffles and these Christmas Three Oreo Truffles is their shape. And that’s actually very good news if you are planning to make them. So that you won’t have to roll the mixture into small balls. 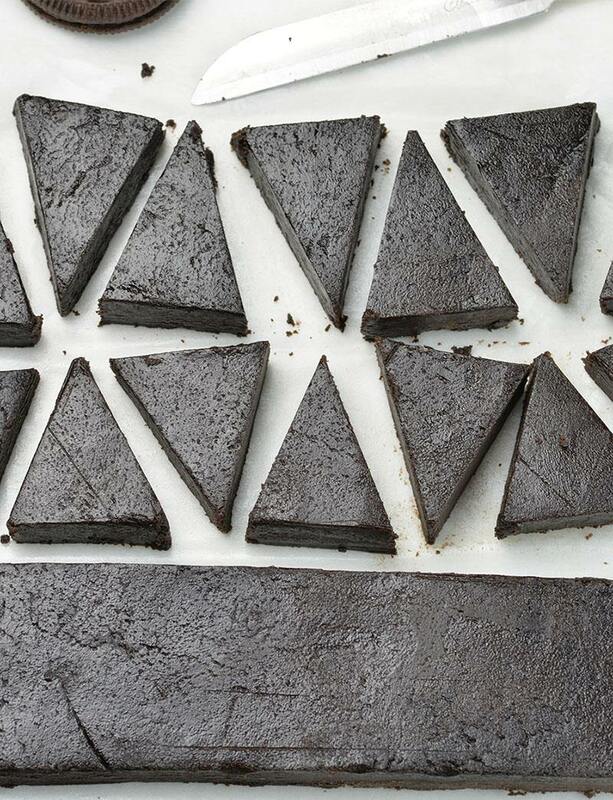 Just press Oreo mixture onto baking paper, flatten it with your palms, freeze and cut out the small triangles. 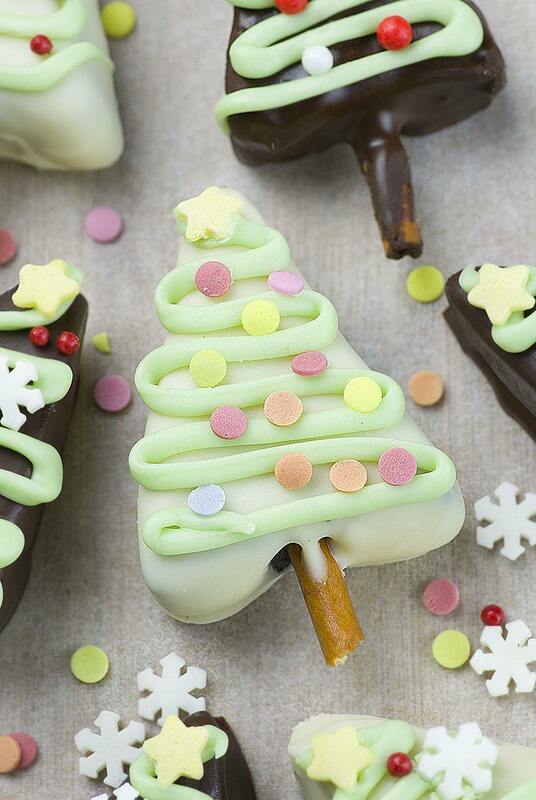 Stuck a piece of pretzel stick into each triangle and you are ready to dip these yummy bites into melted chocolate. As you all know, I like to get back to my tried and true recipes and make a small adjustment to create something new and fun. This time it was the same. I adapted my Oreo Truffles Valentines Heart and got these adorable Christmas Trees. In fact Christmas desserts are all about the cookies and truffles. Whether you are having Christmas dinner at your home, going to a party or cookie exchange, or you need homemade Christmas gift, there’s nothing better than delicious, bite sized treat. After all, if you are looking for more Christmas truffle recipes, check my Cranberry Pistachio White Chocolate Truffles, Red Velvet Truffles or Peanut Butter Cheesecake truffles. Have fun and be creative! Christmas baking season officially starts in a few days!!! Christmas Tree Oreo Truffles are easy and fun holiday dessert recipe! In a food processor ground Oreo cookies with the filling in a really fine crumbs. Add softened cream cheese and process until it well combined. You can do this in by hands, press it with a back of the spoon, or use a mixer with paddle attachment (the mixture is really thick). Transfer the mixture onto baking paper and spread it in a square or rectangle. It should be a little more than ½ inch thick (but less than ¾ inch). I like to cover the mixture with another layer of baking paper and flatten it with a rolling pin. That way the mixture won’t stick on your hands and you can make smooth surface. Place the tray in the freezer for about 30 mins until it’s harden enough so you can slice it easily. Don’t freeze it completely or it will crumble. When the mixture is firm enough, cut it into less than 2 inch wide strips. Separate the stripes and cut it into small triangles. Stab a piece of pretzel stick into each triangle. I twist it back and forth, to avoid cracks. Place the trees in the freezer for at least 30 minutes(truffles must be completely frozen before dipping into chocolate). 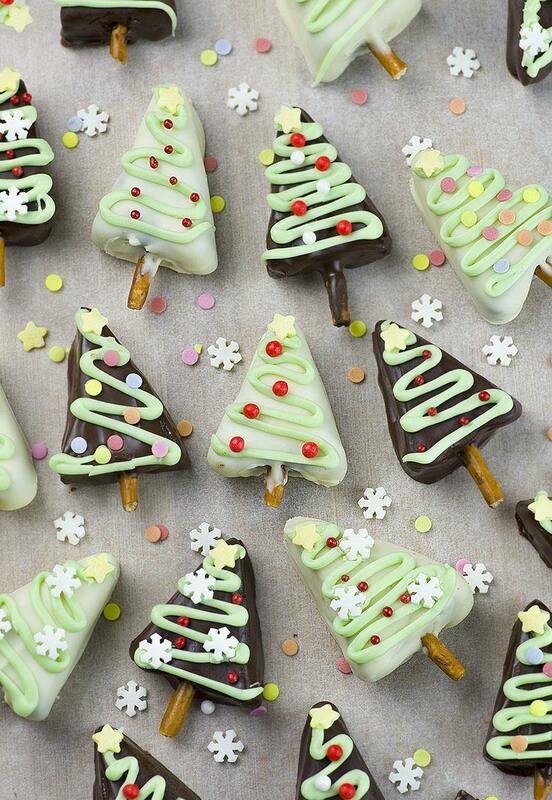 Take a few Christmas trees from the freezer ( so the rest won’t soften while you are working) and dip one tree at the time into melted chocolate to cover completely. Transfer the trees onto baking paper to set. To make green swirls, add a drop or two of green food coloring into leftovers of white chocolate. Then, transfer into a small bag, cut off the corner and drizzle over the truffles. Add sprinkles as desired. I used snowflake sprinkles, little yellow stars and small confetti and pearl sprinkles. Use whatever you have on hand. 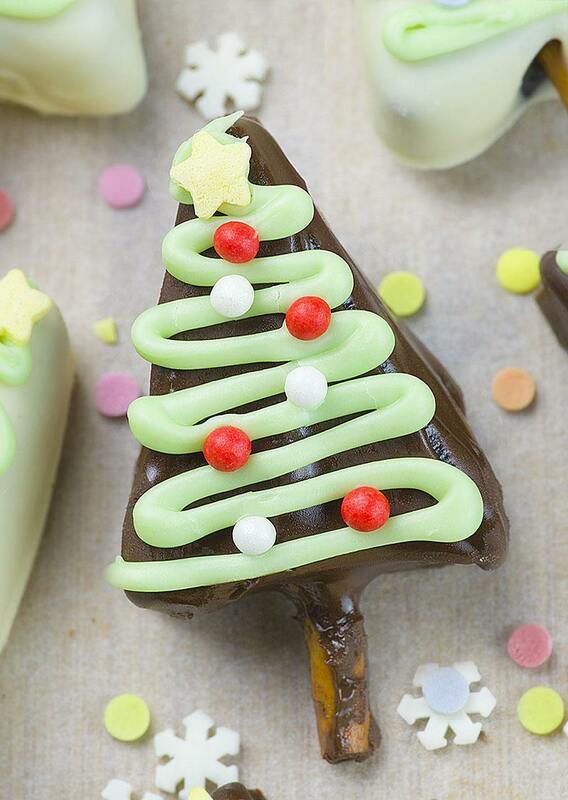 Work in small batches, drizzle green chocolate onto 4-5 trees than arrange the sprinkles before the chocolate harden. Then continue until decorate all Christmas trees. Store in the fridge in an airtight container or freeze for a few weeks.